How does The CD road trip? Join us for our first – food filled – drive down the historic El Camino Real (U.S. Highway 101) from San Francisco to Los Angeles. I was born to road trip. At a young age, I stayed alert and curious of my surroundings on our many family road trips, even memorizing the exit numbers and sign descriptions on the oft-traveled 75 mile (125 km) route to my grandparents’ house. 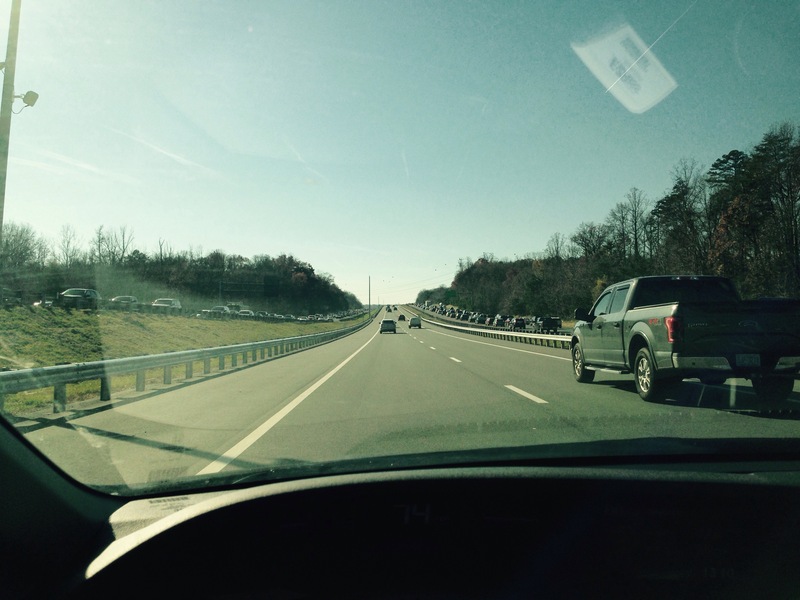 As soon as I became a licensed driver, I road-tripped whenever I could. I remember one of the first entailed carting my friends to my dear friend Caroline’s parents’ river house for a long June weekend, blasting Spice Girls and No Doubt along the way (forgive me, it was 1997!) Just over a week ago, the world lost Caroline, far too young. Her passing brought up so many memories I hadn’t thought of for awhile. They show me how life changes, as we do, and yet some things never do. With only a short long holiday weekend (intentional oxymoron), I took my first major road trip down California’s coastal region via US Highway 101, which also holds the designation as part of California’s historic El Camino Real (Royal Way/Highway) between San Jose at the southern end of the San Francisco Bay and Los Angeles. And of course, the trip involved food and wine stops – all of them spontaneous, which can either be the best or worst kind. Shall we see my hits and misses? Unlike the jarring, otherworldly contrast one might see after flying hundreds or thousands of miles point to point, I love the continuity of a long drive, where the terrain and cultural shifts are more subtle and more meaningful. Highway 101 meanders through a broad range of terrain and microclimates: from the green(ish) forested hills between San Jose and Monterey; to sweeping valleys of farmland and grassy plains, to somewhat sandy-soiled hills covered with vineyards, to rocky, desert mountains, to coastal cliffs. It originated as a Spanish government road that connected the numerous missions in Alta California down to Baja California, back in the good old 17 to early 19th centuries when the former was not an American territory but instead a Mexican province controlled by Spain. Today, the 101 connects large cities (San Francisco, San Jose, Salinas, San Luis Obispo, Santa Barbara, Oxnard, and LA) with small beach and farming towns (Gilroy, San Miguel, Paso Robles, Pismo Beach, Santa Maria, etc.) and isolated stretches that offer few signs of civilization. And in between, many food and wine adventures are to be had. Alas, I could only try a few. 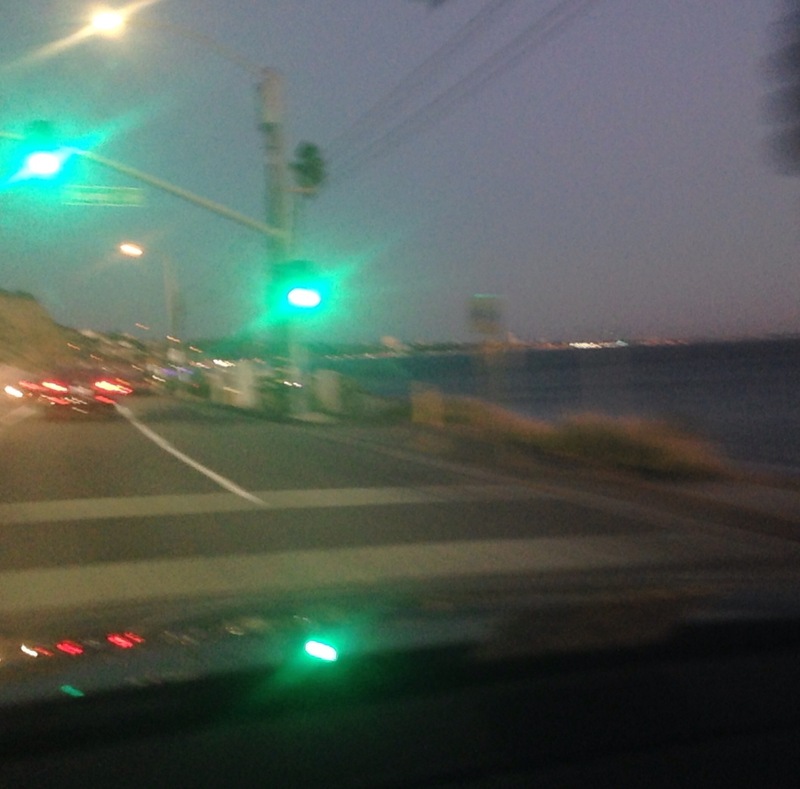 Turning off the freeway – around the halfway point of the outbound trip – literally was a spur of the moment decision spurred by an equally last minute Google search and the small, annoying voice of Future Regret (Oh, and Siri, as usual, was of little help. Way to go, Siri.). 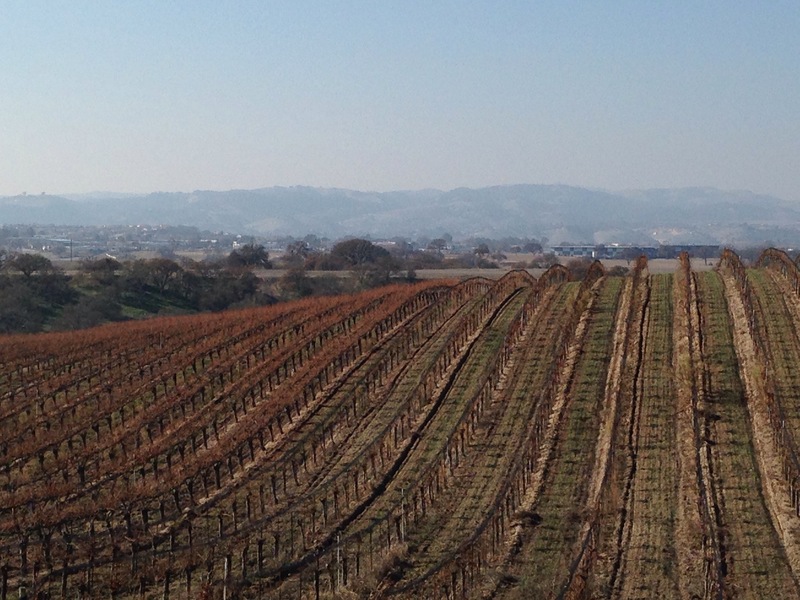 Had I done (any) previous research or experienced much Paso Robles wine before, I might have ended up with a better experience. As it was, I picked one with slight name recognition from the search results. Call it Wine Roulette. I will refrain from naming the winery, as I don’t want to give negative publicity, but if you must know, email us (or just figure it out). A short drive four miles east of the 101 on CA 46, I was pleasantly surprised to find a rustic but busy (good sign?) lodge-like tasting room with friendly staff. Even better was the complimentary tasting of up to five wines of one’s choice – Toto, we’re definitely not in Napa anymore! 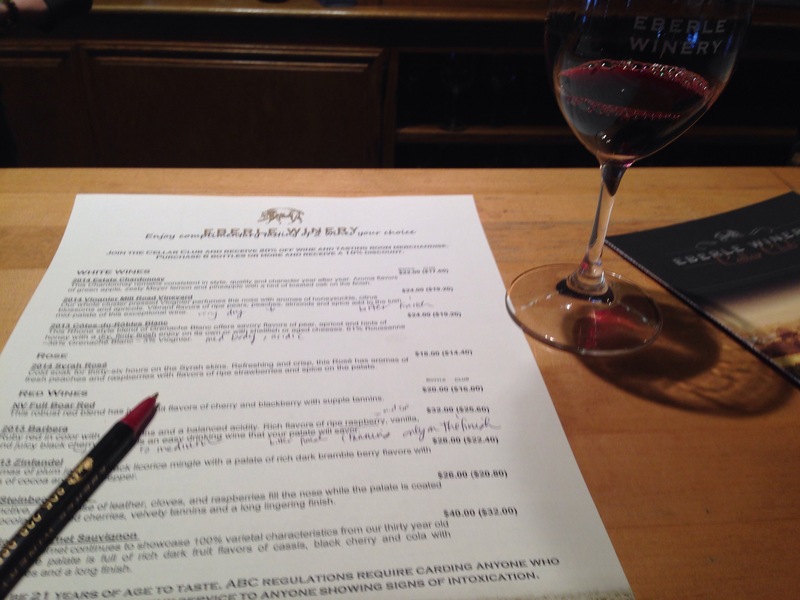 (Tastings in Napa without a club membership often can cost between $25-50 per person). For those of you concerned about responsible driving, know that I sipped and dumped here! Alas, I found every single wine to be incredibly bitter, regardless how many of their oversized, mutant oyster crackers I ate to cleanse my palate. Their Viognier was the most interesting to me. The rosé of Syrah was the biggest disappointing (tannins, lack of complexity). The Cabernet Sauvignon had a wonderful nose reminiscent of black cherry, cola, and vanilla, but it just tasted tannic with a very “green” oak finish. The staff was simply too nice not to make a purchase, so I walked away with a Viognier and some photos. Two thirds of the journey down, I finally made it – very hangry – to my late, quasi-planned lunch in Santa Barbara at the urging of a friend, who swore she would road trip to this taqueria just for tacos. 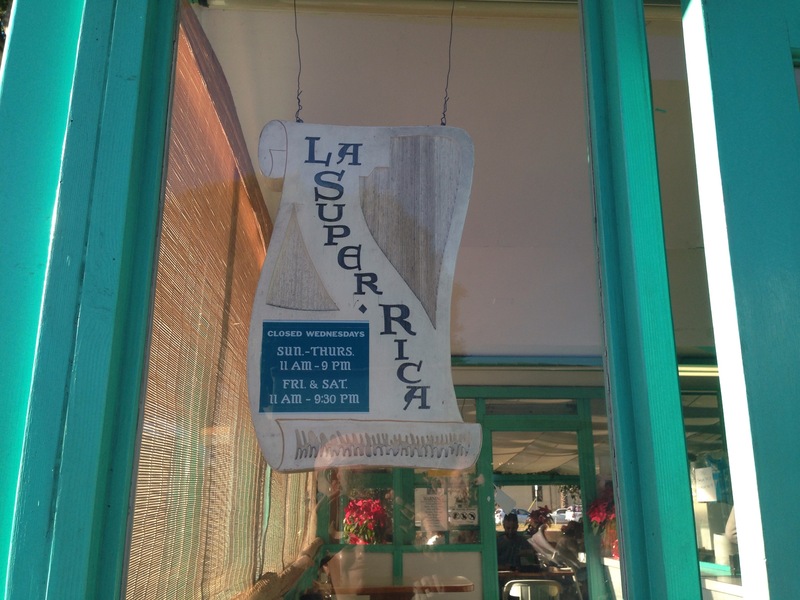 Tucked back from the main drag (State Street) in Santa Barbara is La Super Rica Taqueria on Milpas Street. Though its humble turquoise structure would be easy to miss when passing by, the long line snaking around the entrance is a hint as to why it is everyone’s recommendation. I have to admit that I was a bit nervous that it might be a tad overhyped. Looking at the crowd, it was a mishmash of ages and ethnicities but almost certainly majority tourist. I shouldn’t have worried about the product; the food was fantastic and the not so fantastic wait in line set me back only in terms of my arrival time to LA. The menu consists of 19 standard items, as well as a few daily specials (the latter of which that day included a mouth-watering vegetable tamal). 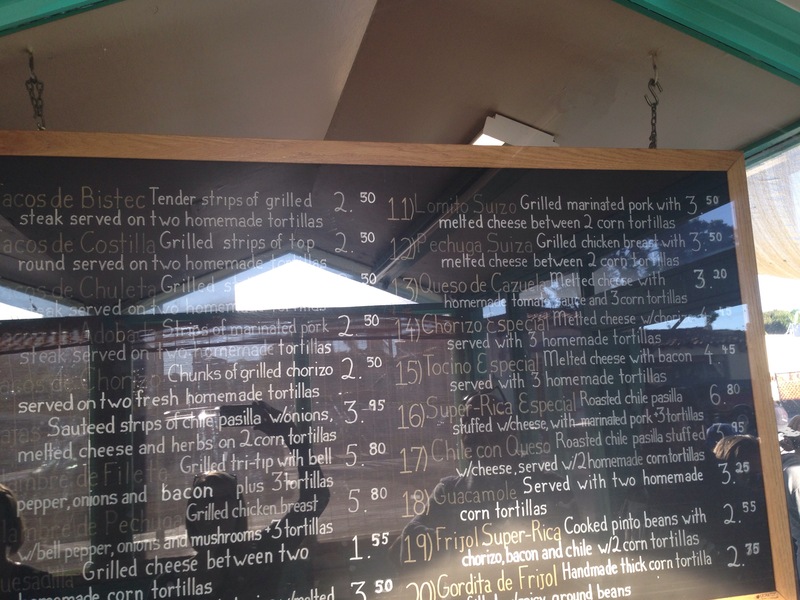 Pay close attention to the menu descriptions; some items are served like small street tacos, while others are large plates full of meat and vegetables with tortillas on the side. All are priced to stuff oneself silly. At any rate, my two selections were filling and flavorful. I ordered for my “main” the #8, alambre de pechuga. 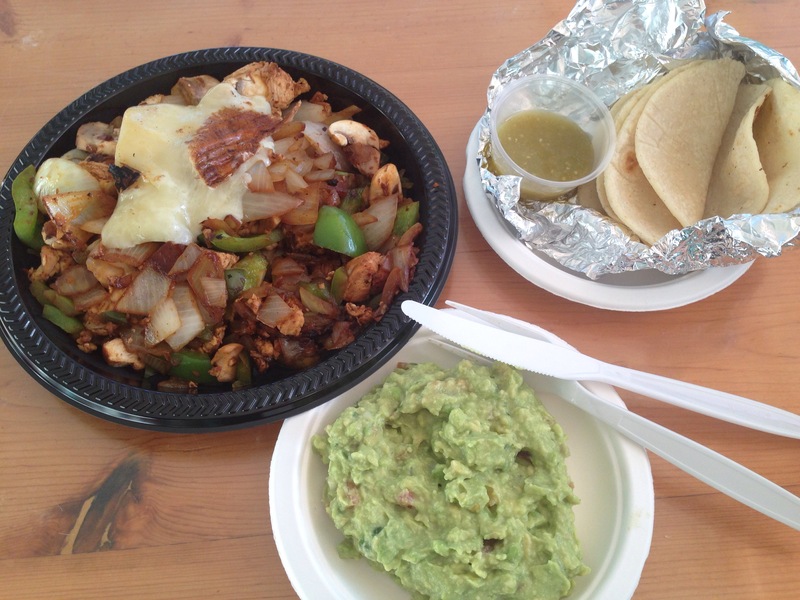 It described the dish as grilled chicken with bell pepper, onions and mushrooms, plus three tortillas. The dish was a large plate full of the meat and veggies, served atop three hidden, homemade corn tortillas. It reminded me of the amazing Turkish Iskender Kavob. I asked for it to be topped with melted cheese and ended up eating it with their killer salsa verde and cutting the tortilla into chunks, mixing it together. I so ordered the #18, guacamole. It wasn’t a stand out but solidly good; it just needed added salt. The salsa verde offered the needed saltiness and the great tang of lime. The wait was worth it, and I was more than stuffed sufficiently for the rest of the drive. On my way to LA, I spent too much time in line at La Super Rica Taqueria to have time to drive through Santa Barbara, one of my favorite cities in California. So I built in another stop on my return trip. I had been told that Santa Barbara had several great French bakeries, so I did a hasty yelp search and found three that sounded great. I went with one that seemed the easiest to access. Renaud’s patisserie and bistro, though tucked in a corner of a shopping center, is a Santa Barbara staple. Its clientele are predominantly locals – an encouraging sign. I ordered the almond croissant after reading numerous rave reviews (the croque Madame was the other frequently mentioned menu item). 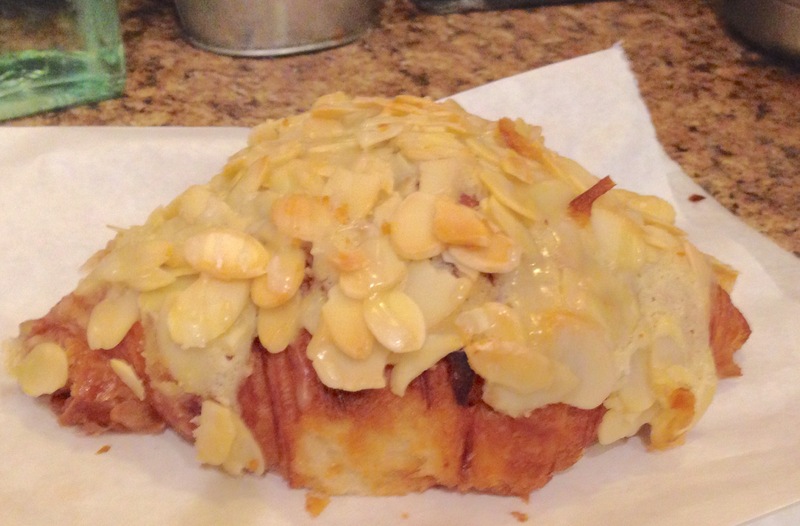 The large croissant is covered in a not-too-sweet almond icing and thick slivers of almond. Inside is a very generous almond custard filling. My verdict: B+. I have to qualify that I have had some truly wonderful croissants in my day – most of them inexpensive and most outside of the US. Renaud’s version was a bit brittle for my liking on the exterior; the texture was soft but perhaps too dense on the inside. The filling and icing had nicely balanced flavors, but I really appreciate croissants with the strong almond flavor of almond paste, which did not come through in this one. Alongside coffee, though, it was one American breakfast I would never refuse! This post is long in story but short in food adventures! I definitely will do another trip again with new – better planned and more obscure – food and wine adventures to share. Stay tuned! Previous Post Happy New Year from The Culinary Diplomat!